BitTorrent, the once-notorious P2P file-sharing site that has turned a new leaf as a legit, distributed computing provider, is today launching SoShare, a service to send large files from one computer to another, with the first terabyte of files sent free. Out today in beta for Google Chrome, Firefox and Safari for Mac; and Chrome, Firefox and Internet Explorer for Windows, the service competes with the likes of YouSendIt, as well as DropBox, Box and other cloud-storage and file-transfer services. SoShare was previously available in alpha as Share, and it complements Sync, BitTorrent’s cloud-based service that syncs your computer’s files with a cloud storage service, which itself launched in alpha in January. The idea behind SoShare is to target creative professionals — designers, photographers, musicians, and so on — who handle large data files and need to send them to others. That makes sense, since it also targets that community for content for its consumer-facing services. SoShare is built by BitTorrent engineers, on BitTorrent’s P2P framework (however, BitTorrent confirms that it still uses Amazon’s S3 services for caching, as it did in the alpha version), and will sit alongside Sync in Labs, BitTorrent’s “test kitchen,” where it puts work in progress for its community to try out and develop into potentially more commercial products. With a number of companies like YouSendIt and SugarSync, newer players like Mega, and more established startups like Dropbox already developing names for themselves in the same space as SoShare, it will be worth seeing whether BitTorrent can entice more people to its platform by way of the very large file size threshold — one free terabyte being possibly the largest data allowance yet. Meek cites figures from the Americans for the Arts that estimate 3.34 million Americans are employed in the creative industries. “They work in large file formats — photo, audio, film. And their work is dependent on being able to send and deliver these large file formats to collaborators and clients [but] right now, doing so is costly and difficult. Email places restrictions on file size and file management. Syncing services quickly transition from free to high-fee. Sending services are not designed for creative asset delivery. 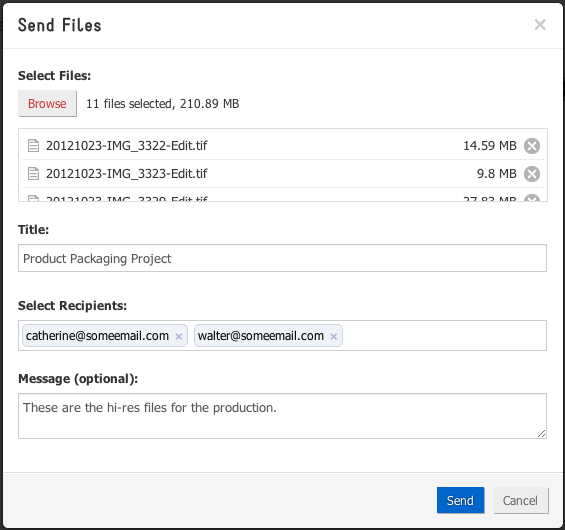 While BitTorrent describes this as a file-sending service, it actually keeps a copy in the cloud. It uses a plug-in, required by those both sending and accessing the file, to help manage bandwidth around that file and to download it. “SoShare accommodates distributed file transfer while the service maintains one master copy in the cloud for reliable access,” Meek says. “The more people that have access to a file, the more the SoShare plug-in can help with the availability of bandwidth.” The plug-in also lets users pause their uploads/downloads and resume them at other times. Rather than actually sending files to the other computer directly, it works by sending an email with a link for access and to download those files. As with services like Dropbox, you can see a thumbnail gallery of the files before downloading. It also offers a feature to let users know if and when they get delivered and viewed, and you can create both private and public links to share on sites like Facebook and Twitter. For regular users you can also create address books for frequent contacts. Files stay on BitTorrent’s servers for 30 days, but users can also download them to keep them longer; alternatively you can erase them before the 30 days are up. In playing with it to send myself a file, the user interface appears relatively simple to use. But perhaps a little too simple: in the sign-up process, there is no email verification whatsoever, which seems like at least one loophole for possible malicious use.